“A long time ago, every year when I watched the Oscars with my dad, my dad always said, ‘Son, you get so many movie awards around the world, when are you going to get one of these?’ Then I just look at my dad, ‘Hahaha, Dad, I only make comedy action movies,” said Jackie Chan, holding the gold Oscar statuette and beaming with joy at the 8th Annual Governors Awards ceremony on 12 November 2016. As the first globally recognized Chinese martial arts actor, Bruce Lee froze his youth on screen when he died at the age of 32, whereas the 62-year-old Jackie Chan still jumps out of windows, kicks, punches and breaks bones in films. His latest film, Railroad Tigers, was released on 23 December 2016. In it he plays an ordinary railway worker who accomplishes something extraordinary at a troubled time. Chan cannot put a finger on the exact number of films he has appeared in before Railroad Tigers, a mathematical puzzle that, for him, is unfathomable. Having strived to make it in Hollywood and around the world for decades, Chan is, in his bones, an old-fashioned Chinese, stubbornly sticking to the most traditional values. 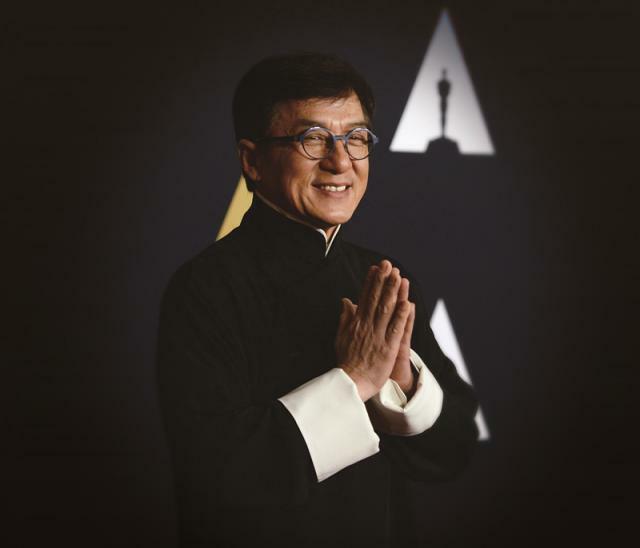 A modest, calm, patriotic Chinese man of integrity – with a dash of humor: that’s Jackie Chan’s ideal self image, which he hopes to show the world. “[Bruce] Lee is the hero as superman. To admire him is to worship the cult of the body as a machine that inflicts pain. [Jackie] Chan, in contrast, represents the hero as the all-too-human underdog,” wrote well-known Hong Kong film critic Perry Lam in his book Once A Hero: The Vanishing Hong Kong Cinema, comparing the two leading martial art movie stars. Even though, as Lam indicates, Chan started out by imitating Bruce Lee, as did almost every leading male in martial arts movies who came after the great icon, it did not take Chan long to find his own voice and create his own style of heroism. In contrast to Bruce Lee’s characters, who were typically stern, morally upright heroes, Chan plays well-meaning, slightly foolish everymen who triumph in the end despite the odds. Chan consciously challenges the definition of hero and has a particular interest in exploring the dynamic underdog/hero relationship. His latest work Railroad Tigers is the third film in which Chan cooperated with the director Ding Sheng, following Little Big Soldier (2010) and Police Story 2013 (2013). The movie is about a team of rural railway workers opposing the Japanese as freedom fighters during the Second Sino-Japanese War to get food for the starving poor. They are not typical heroes, but a group of regular men who use shovels as their weapons, earning them the name “railroad tigers” from the locals. This time Chan consciously “backs off” in the film, a point that both Chan and Ding Sheng agreed on. “Jackie and I believe that Railroad Tigers is about a team, not a one-man show. 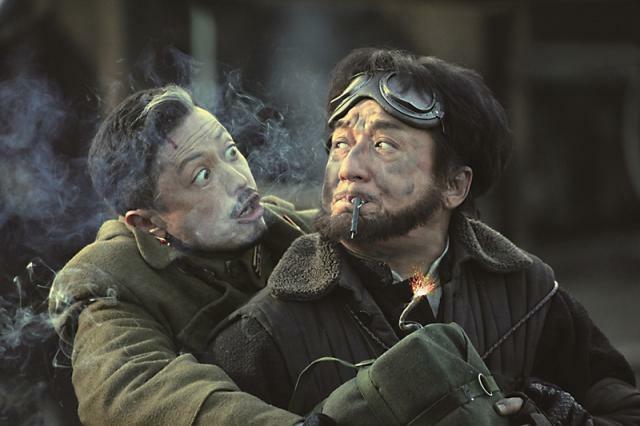 We hope audiences will feel the power of the team while watching the film,” Ding told NewsChina. Chan does not play a cool character, nor has as much of a love interest as before – that’s the job now of his co-star Wang Kai, a charming and much younger actor. Female cinema-goers reportedly go crazy when Wang slowly appears on screen on horseback. Like all his previous films, Chan did all his stunts himself. In a train scene shot on a wintry day, at -18 degrees centigrade, Chan, who could not wear a coat for the scene, had to clamber on top of the train, with an icy wind biting his face and dust getting in his eyes. He wanted to rinse the dust away with eye drops but found that the drops had already frozen. “It was freezing cold. Every move and punch, my muscles ached all over. When I climbed on top of the train, I felt as if my heart was frozen and even the urine in my bladder was frozen! I couldn’t feel my fingers when pulling the trigger on the gun,” Chan recollected with a smile. Over the years Chen has been injured many a time when attempting stunts, including a dislocated pelvis and numerous broken bones including fingers, toes, nose, both cheekbones, hips, neck, ankle and ribs. But in normal life, Chan is a very cautious person who seldom takes risks. “I did many foolish and impetuous things when I was young, which left some lifelong regrets. […] Now I won’t go on any risky adventures in life. I often refuse friends’ invitations to go skiing or diving. For me it’s pointless to risk my life for adventures or meaningless sacrifices. But making films is different. I dedicate my whole life to film and will try anything dangerous if asked to. I find it worthwhile,” Chan told our reporter. He is particularly fond of the word “discipline,” one of the most frequently used words in a martial artist’s vocabulary. Jackie Chan never avoids boasting about his humble origins. When Chan was six years old his father took a job as the head cook at the American embassy in Australia, and Chan was sent to the China Drama Academy, a traditional Peking Opera school. Life in a traditional Peking Opera school could be very harsh. Like other parents, the Chans signed a contract with the school that would allow the instructors to punish him with anything up to and including death if he disobeyed. No matter how naughty and disobedient a boy was, the school would discipline him into following the rules. During Chan’s time at the school, he learned martial arts, acrobatics, singing and acting. Training would last for up to 18 hours a day. The boys rose at 5 o’clock in the morning and spent the whole day training till midnight. “It was really arduous, we hardly had enough to eat, enough clothes to keep warm, training was extremely tiring, and our master could cane us at any point,” Chan once described the experience in an interview in 2008. For ten years Chan and a dozen or so pupils slept on the ground. The carpet, unchanged for several years, had long since lost its color and turned dark gray – “on it we ate, slept, peed at night and had nightmares,” Chan told NewsChina. This was the world that Jackie Chan was familiar with from 6 to 17, a small world of hierarchy, discipline, brotherhood and violence. During his time at the China Drama Academy, Chan made his acting debut aged eight in the Cantonese movie Big and Little Wong Tin Bar (1962). He later teamed up with other opera students in a performance group called The Seven Little Fortunes. As Jackie got older he worked as a stunt man and extra in the booming Hong Kong film industry. After graduating from the China Drama Academy, he soon earned a reputation in Hong Kong as an action movie actor because of his fearlessness. Eventually Chan ended up in the United States to make his first Hollywood movie The Big Brawl (1980). It was not a success. Next came Cannonball Run (1981) in which he played a minor role. In 1985, Chan went to the United States to make The Protector which was a huge flop. Chan temporary abandoned his attempts to enter the US market, returning his focus to Hong Kong. It would be 10 years before he returned to make the successful Rumble in the Bronx (1995). After that came Rush Hour (1998), Shanghai Noon (2000) and Rush Hour 2 (2001). Jackie Chan had achieved his dream of being a superstar in America. “Thank you, Hong Kong, incredible city, China, my country, proud to be Chinese,” said Jackie Chan at the Governors Awards. A past incident flitted through his mind as he stepped down from the podium. Many years before, when Chan was rising to fame in Hong Kong cinema but was yet to play a role in an English-language film, he received an interview invitation from a foreign television program. However, when Chan arrived at the studio, after a six-hour flight, he was ignored by the program anchor as he could not speak English. “I took a twelve-hour round trip, but they sent me packing just because I couldn’t speak English. I got really mad,” Chan told our reporter. Compared to many other celebrities from the Greater China region, Jackie Chan is particularly sensitive about nation and patriotism. After emigrating to Hong Kong in the 1950s as refugees, Chan’s parents worked for the French consul’s family. Charles worked as a cook and Lee-lee a housekeeper. Chan spent his childhood years in the grounds of the consul’s residence in the Victoria Peak district, a wealthy neighborhood in Hong Kong. “It was very lucky for my parents to find jobs like that, in that they were refugees. Though my family was very poor, I was born and lived in a grand mansion on the Peak. The consul’s family lived in the front house, gorgeous and spacious, but my family hid in the backyard, cramped and shabby. […] Two families lived in one place. They treated us very well, but we were still in two entirely different worlds,” Chan told NewsChina. As a boy, Chan had a clear sense of discrimination in the “two worlds” hierarchy. As he recollected, at that time, the British enjoyed supreme status in Hong Kong. “I would naturally give way and walk along the edge of the road when I saw a foreigner coming. They took the elevator and I could only take the stairs. If I got into a fight with a foreign kid, my dad would definitely beat me and drag me to apologize to the foreigner,” said Chan. Such feelings of being discriminated against continued in his early days in Hollywood in the 1980s and 1990s. “At that time, Hollywood did not approve of my design of stunts at all. No one listened to my voice. Every opinion I put forward would be rejected. I tried my best to perform, but they didn’t like it. So my shots were always being cut, cut, cut,” Chan told The Paper after wining the Oscar. “They always told me ‘China is not our market. No need to mind China.’ But today Hollywood values both my opinions and the Chinese market. They will ask me what Chinese like to watch. […] I am proud that my country is becoming stronger. The time when nobody listened to a Chinese is gone,” Chan added. Chan had no chance to get a formal education. What he learned about culture he gleaned from the stories in the ancient operas that he read during his Peking Opera school days. The traditional, even old-fashioned values, discipline, loyalty, heroism and patriotism are deeply etched in his mind and formed the principles he still sticks to. Apart from being an actor, Chan is also a prolific singer. He has recorded over 20 albums, with over 100 tracks. In 2009, one of his favorite songs “Country” (“Guojia”) was created as part of the 60th anniversary celebrations of the founding of the People’s Republic of China. Over the past decade, Chan has performed at several national celebrations where he always sings patriotic songs towards the end of the event. “I’ve been through extremely complicated times and environments, too complicated to mention. I grew up in Hong Kong and matured around the globe, and I always think of doing something for my country. It’s not just empty words,” Chan told NewsChina.